The Freedom To Fall - Are You Ready For Your Soulmate? So you want a soulmate do you? Okay not necessarily something that big and cosmic but 'happily ever after' would suffice just fine. Maybe you have somewhat of an idea the type of person you're looking for and you want to place your order with the cosmos - 'one true love meant for only me, please and thank you.' Let me ask you this - are you ready? Are you worthy? Do you have the freedom to fall madly head over heals in love? Have you made a space for that one true love to fit so beautifully nested into your life? Don't be foolish and assume that all things will just naturally fall into place once they show up. Come on now, you know better than that. Life doesn't play like that. The rules of manifesting dictates that you have to make room for that which you are wanting to attract into your life. You know that two things cannot occupy the same space. When we want new clothes, we have to first clear out the old ones from our closets as part of letting the universe know that we are making ready a space for that new wardrobe. Nature abhors a vacuum; something will come to fill that space. The closet never stays empty for very long does it? So have you made a space for your beloved? Are you single and free? Free to fall doesn't just mean that you are technically not dating or married. You can be married to your job, your hobbies, your workout routine, your children, your pets, your church, your parents, or the memories of someone you are no longer intimate with. You can have these things in your life and walk within balance knowing that they are not the one true love that feeds that place in your soul that only a romantic partner can fill. However, when you replace the love of 'happily ever after' with your career or with parenting, then you have given your beloved's special place away to another. You are married in essence to that which has taken the place of a strong romantic bond. Are you married or involved with someone else while calling your soulmate to you? Perhaps you want your new love to rescue you from your current situation. Perhaps you feel too vulnerable and afraid to be single until the right one comes along. Perhaps you are simply selfish and don't want to do without someone in your life. Whatever the reason, you want to create a new love before leaving the failed relationship. It's no good. You are telling the universe that you do not trust it to provide you with real love. You are also telling the universe that you are not strong enough to hold up your end of a relationship. If you cannot show integrity towards the one you are ending with, then how are you supposed to be honest with the new one? If you are not strong enough to be single and walk alone until the right one comes along, then you do not deserve your soulmate's presence. Soulmates are not magical healers and fixers of life. They are your twin soul. They are you in a second body. If you are not strong enough to wait for that one, then you cannot have that one. "Okay," you say, "then just give me a really nice person that I can happily spend the rest of my life with. You are right, I'm not all that strong and I'm not really able to be alone for any length of time. So, just give me a very nice person that's not quite a soulmate." Relationships created in desperation, need, and greed very rarely work out. What you've just told the world is that you're desperate and anyone will do. And that's what you'll get, anyone - not the one. You must be romantically unattached when you begin your search for love. It's karma, it's trust, it's morals, it's only fair. And what of your overall worthiness - are you worthy? This is not a beat yourself up question. Imagine that special person is alive and real flesh and blood person out in the world searching this very moment for 'happily ever after' just like you are. Are you the kind of person that you would spend time searching for? If the person meant for you was indeed your perfect match, what would they look like? How would they behave? How would they feel and respond? Look into the mirror my friend - are you what you are looking for? Until the person you see in the mirror is worthy of your love and attention, then you will not recognize your twin soul. For they share your essence. Become the type of person that you would want to find and in so doing so you will become the kind of person that your rightful partner wishes to find. Now you will be able to recognize each other and accept each other. Trust me, there is nothing worse than finding your soulmate when you are both screwed up and dysfunctional - intense and ugly, rather than intense and beautiful. 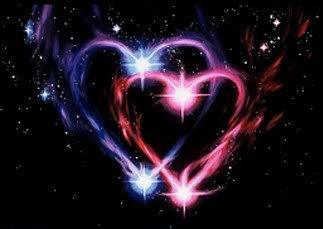 If you want to call a magical cosmic kind of love into your life, then you must look at what your life is now. Is it inviting and warm? Would it nurture or challenge true love's growth? Are you ready, really ready? Is the space in your heart, in your life, in your bed where only one's most treasured beloved belongs cleared out and available for them to lay their weary head once they do find you? My father used to tell me that he had pockets sewn all over his heart and each of us had a special pocket in which nobody else could fill. Is the 'happily ever after' pocket of your heart big enough and ready? Is there space for real love in your life? Are you free to fall?